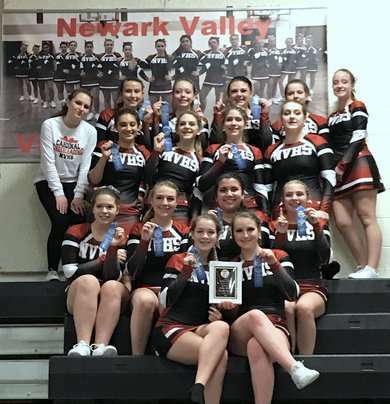 NEWARK VALLEY - Host Newark Valley won both the small squad and overall championships at the 44th annual IAC cheerleading competition here Saturday. The Cardinals won the small squad division over runner-up Marathon and third-place Moravia. Edison bested Waverly for the large squad honor. In co-ed, Dryden won ahead of Whitney Point and Watkins Glen. NV's 70.6 points also earned the squad the title of overall IAC champion. IN PHOTO: The Newark Valley cheer squad. ... COURTESY PHOTO.